So, I started thinking about cabbage. When I was a kid my grandma made freezer slaw. I loved that freezer slaw so I decided to try my hand at it. However, I had a problem. The cabbages in my box were green. Gramma’s slaw was always purple. What was I supposed to do? Matching is an important component of nostalgia. I went right out and bought a little purple cabbage to add to my big green one so that I could have the desired purple slaw. Two weeks in a row I made freezer slaw. Now I could eat coleslaw all winter instead of six nights in a row, but the freezer was full and I was still getting cabbage. Now what? 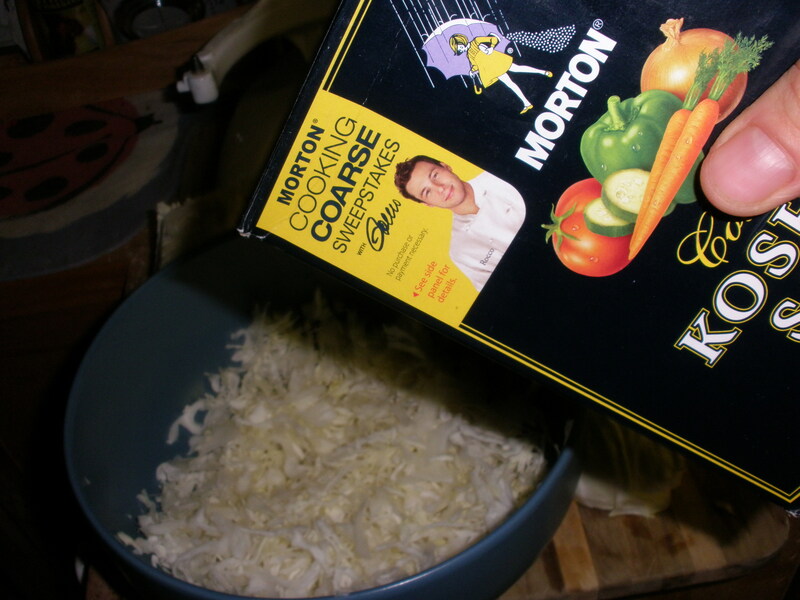 That was about the time I stumbled on this post at “Grow the Change” about making sauerkraut. I did a little more research and decided to give it a go. Of course, when I wanted purple cabbage I had green. Now that I wanted to make kraut, I had purple cabbage. 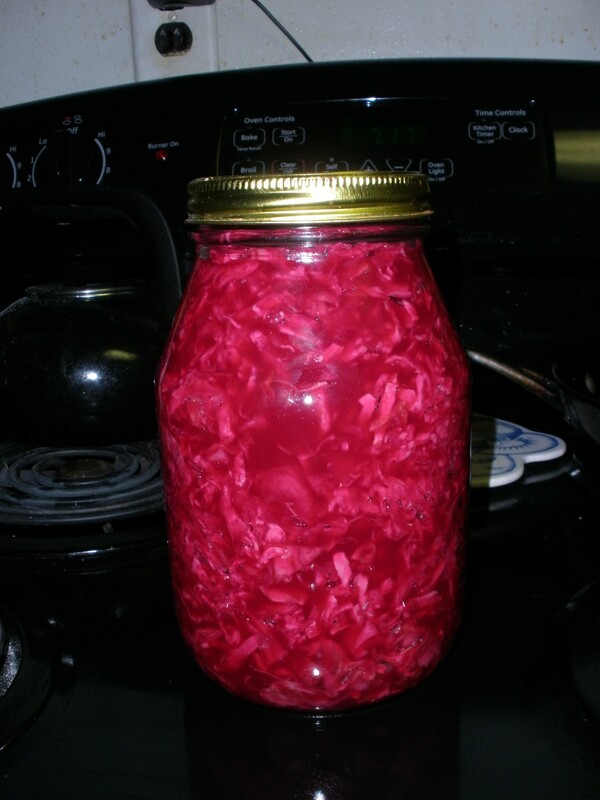 So, my first batch of kraut was a beautiful, purple-pink color. I have never loved reuben sandwiches, but for some reason, that vat of homemade kraut made me want them. Reubens became our Saturday lunch of choice and I was even coming home from work at lunch time to make myself one during the week. Alas, all those reuben sandwiches quickly blew through my supply of sauerkraut and left me wanting more. I bought a large head of cabbage at the Farmers’ Market and decided to give it another go. Sauerkraut is actually pretty simple. Shred up some cabbage, salt it, smoosh it and ignore it for a while. The handy-dandy Kitchen Aid mixer, shredder, multi-purpose tool shredding my cabbage for sauerkraut. So, let’s start with shredding up some cabbage. I LOVE my Kitchenaid mixer. Have I told you this before?? I really couldn’t live without it. (Okay, I could live, but I wouldn’t be happy.) 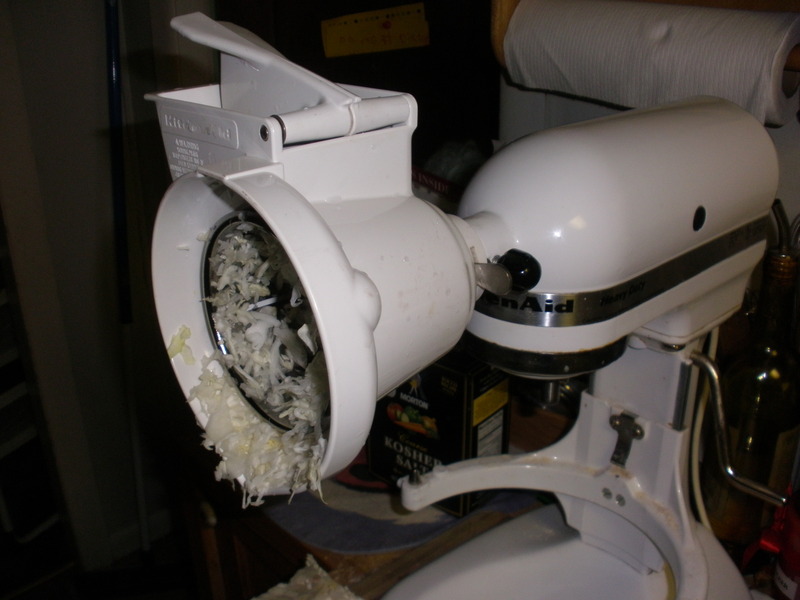 Cut the cabbage into chunks that will fit into the shredder attachment on your mixer and feed them in. Or, drag out the old hand shredder and start working on the chunks of cabbage. Hand shredding works just as well, it just takes a lot longer. As you shred the cabbage, dump it into a bowl. Every time you add a couple of cups of cabbage to the bowl, sprinkle it with a layer of Kosher salt and mash the cabbage down a little. I don’t measure the salt, just shred and sprinkle, shred and sprinkle until you run out of cabbage. The salt and the mashing help draw the water out of the cabbage to create a brine for your sauerkraut. Add salt after every few cups of shredded cabbage. Once you have shredded and salted all the cabbage, you have to find a way to ( let me use the technical term here: ) smoosh the cabbage. 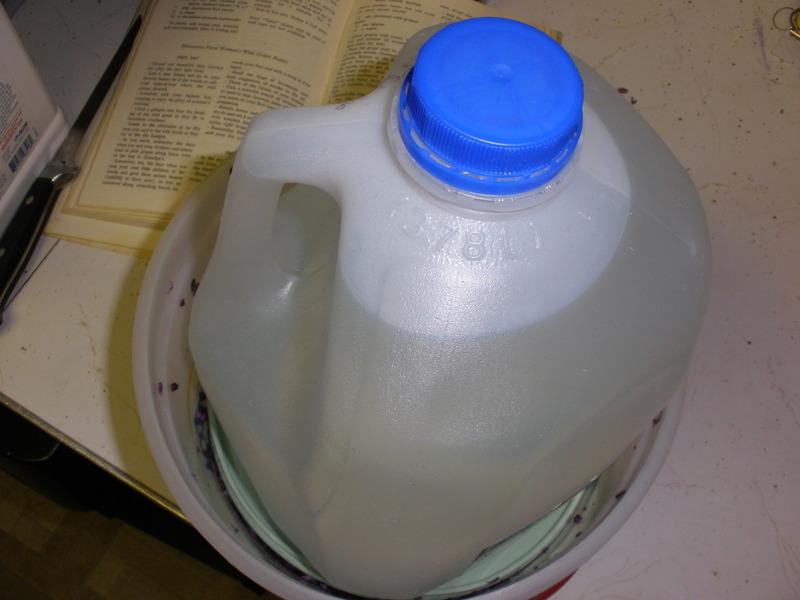 The bowl I use is wide enough at the top to accomodate a small-sized plate and a gallon jug filled with water but any heavy, stable, clean item can be used as a smoosher. An old, 5-qt. ice cream pail works well as a starter kraut crock. Press the smoosher down every once in a while to assist in the formation of a brine for your kraut. Smoosh the cabbage to extract the juice. After a day, the kraut should be submerged under liquid. If it isn’t, add enough salt water to cover the cabbage. Cover your kraut contraption to keep out flies and dust and then ignore the kraut and let it ferment. Check on it every couple of days. If it starts to get “scummy”, scrape it off. Taste the kraut each time you check on it. If it isn’t ready, wash the plate or lid you are using as a press and return it. When it has fermented enough to taste like kraut, scoop it out and put it in the fridge. I put mine into clean canning jars, but you have to screw the bands on loosely so that pressure can escape. DO NOT FILL YOUR JARS TOO FULL. The fermentation process will cause juice to bubble out of your containers and all over the bottom of your fridge. I learned this the hard way. The purple jar of kraut in the first picture was way too full. Make sure to keep the kraut covered with brine even in the fridge; if the cabbage is exposed to air for any length of time funny, unpleasant microbiology experiments can take place. So cute that even dh doesn't mind it sitting on the counter. 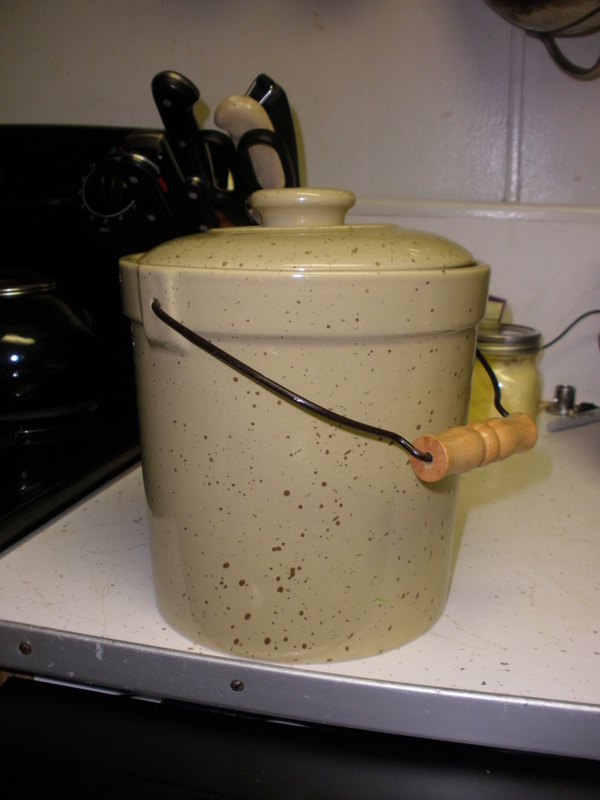 I enjoyed my homemade kraut so much that I found this cute little crock at the Women’s Resource Center, a resale shop nearby for $4 to use. A plastic lid and a quart canning jar filled with water fit nicely inside to use as a smoosher.